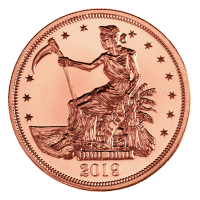 Obverse Effigy of Queen Elizabeth II and the words "Elizabeth II 1 Dollar 2019"
Effigy of Queen Elizabeth II and the words "Elizabeth II 1 Dollar 2019"
1/20 oz 2019 Canadian Maple Leaf Gold Coin Purchase your 1/20 oz 2019 Canadian Maple leaf gold coin from our store online to enjoy the internet’s most competitive price. 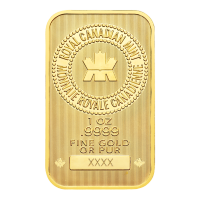 The Royal Canadian mint delivers another pristine tribute to the world’s most well recognized Canadian tree and leaf, the Maple. Employing state of the art micro-engraving techniques and unparalleled design prowess, the reverse feature include a single, meticulously rendered maple leaf, set against a light catching star burst field. 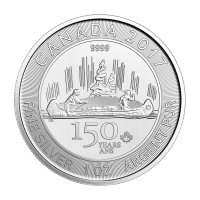 Also on the reverse, the Canadian legend, a maple shaped mintmark, as well as details of the coin’s weight, purity and metal content. 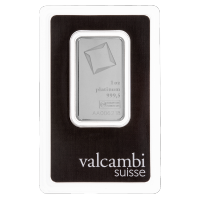 The obverse field also boasts that exquisite starburst field of of micro-engraved texturing, as well as a simplistic but pristine rendering of Elizabeth II in profile. 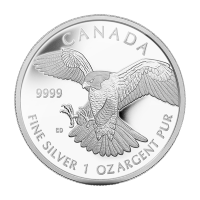 Also on the obverse, Elizabeth II’s name, along with the coin’s uniquer face value. 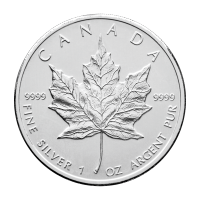 The recognizable and immaculately rendered, time honoured symbol of Canada, along with the dazzling minting skills evident in every coin makes the Canadian Maple leaf coin one of the world’s most popular and reliable choices for investors. 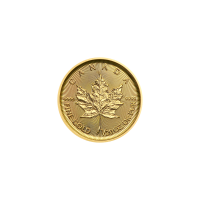 Take home an infallible pinch of Canada’s vast beauty and diversify your holdings with a 1/20 oz 2019 Canadian Maple Leaf gold coin today.